Obsolete: What's the difference between the death of one Lebanese politician and the deaths of over 1000 Lebanese civilians? What's the difference between the death of one Lebanese politician and the deaths of over 1000 Lebanese civilians? The murder of Pierre Gemayel, Lebanese industry minister and a leading critic of Syria's role in the country, as well as being the son of the former president, is a shocking crime that has rightly been condemned by all sides, including by Syria. What a sharp contrast it makes though with the reactions of both Tony Blair and Margaret Beckett to the events this summer, when Israel launched air strikes across Lebanon in response to the Hizbullah abduction of two Israeli soldiers, which resulted in the deaths of over 1,000 Lebanese civilians, the destruction of 74 bridges and 94 roads and an environmental disaster after the bombing of Jiyeh power station, which leaked 20,000 to 30,000 tonnes of oil into the Med. The UN has put just the initial clean-up bill at $64 million. It took 12 days for Tony Blair to even so much as say that he wanted the killing to stop. Before then, Beckett, when asked whether she thought Israel's response was disproportionate, said that she "didn't think it was helpful to get into that." Only when it became apparent that Israel was not achieving its objectives, and that the whole international community apart from the United States, the UK and Israel wanted an immediate unconditional ceasefire, was a UN resolution finally passed, on August the 11th, nearly exactly a month after the beginning of the conflict. We condemn this murder utterly. It is completely without any justification at all. We need to do everything we can, particularly at this moment, to protect democracy in Lebanon and the premiership of Prime Minister Siniora. How strange that it's only now that he wants to protect democracy and Siniora. The destruction of a large swath of southern Lebanon has been the catalyst for the current turmoil which Lebanon is experiencing. While Siniora appeared on TV screens daily, pleading for an end to the violence, questioning whether "an Israeli teardrop was worth more than a drop of Lebanese blood", Blair and Beckett refused to stand up for Lebanese democracy. Whether Syria carried out the assassination needs to be urgently investigated. It's worth wondering however just how Syria would benefit from a renewed surge of finger-pointing at them, just as the country appears to be regaining its stature within the region. The Iraq Study Group seems likely to recommend that the US at least starts talks with both Syria and Iran in an attempt to find a way out of the impasse in Iraq. Syria has just re-established diplomatic ties with Iraq after 24 years. Iran's president has invited his counterparts from Iraq and Syria to a conference this weekend. At the same time, two weeks ago the US suggested that Iran and Syria were plotting a coup in Lebanon, and Hizbullah has almost succeeded in bringing down the Sinioria government, after leaving the cabinet and taking other Shia representatives with them. As Juan Cole notes, Lebanon has in a sense become the new Middle East experiment for the neo-cons and interventionists led by Bush and Blair. The assassination of Hariri, whether it was carried out by Syria or not, led to the Syrians' withdrawal. Ever since, the nascent democracy in Lebanon has been supported to the hilt by the West, as part of the strategy to isolate both Iran and Syria. Where the real sympathies lie though was exposed by the Israel-Lebanon-Hizbullah war. While the US expected that Israel would destroy Hizbullah in double-quick time, humiliating the Shias and further diminishing Iran and Syria's influence, the opposite happened. While Lebanon itself took the damage of the war, Hizbullah were strengthened immeasurably, winning the support of the Arab street and leading Nasrallah to demand more power for his previously unpopular terrorist organisation. Gemayel's assassination is only the latest salvo in what is an increasingly bloody situation which is engulfing the Middle East. 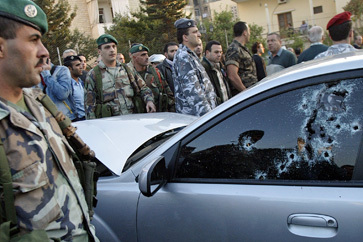 Whether his assassination turns out to be another Hariri moment remains to be seen. Either way, it shows how the Iraq war has rather than made the region safer and more secure as promised, has instead had the effect of pouring petrol onto an already lit bonfire. International Airport as he attempted to board a flight while in possession of a ruler, a protractor, a set square, a slide rule and a calculator. At a morning press conference, Attorney General Alberto Gonzalez said he believes the man is member of the notorious Al-gebra movement. He did not identify the man, who has been charged by the FBI with carrying weapons of mathinstruction. "Al-gebra is a problem for us," Gonzalez said. "They desire solutions by means and extremes, and sometimes go off on tangents in search of absolute value. They use secret code names like 'x' and 'y' and refer to themselves as 'unknowns', but we have determined they belong to a common denominator of the axis of medieval with coordinates in every country. As the Greek philanderer Isosceles used to say, "There are 3 sides to every triangle." given us more fingers and toes." Chris Bryant: Humourless ex-Blairite automaton. When is a disaster not a disaster? One day, two different faces of American justice. Scum-watch: Human wrongs over heroin payout.